Just take a moment to consider the title, caramelised white chocolate… White chocolate that has been caramelised. Caramelising stuff has the extraordinary ability to make anything taste at least 100 times better than normal so as soon as you put some good quality (*cough* Green&Blacks *cough*) white chocolate through the process the result is actually magical. I thought this was fitting for the festive period. It’s light enough to eat after a heavy dinner but indulgent enough to satisfy your high expectations for Christmas food. 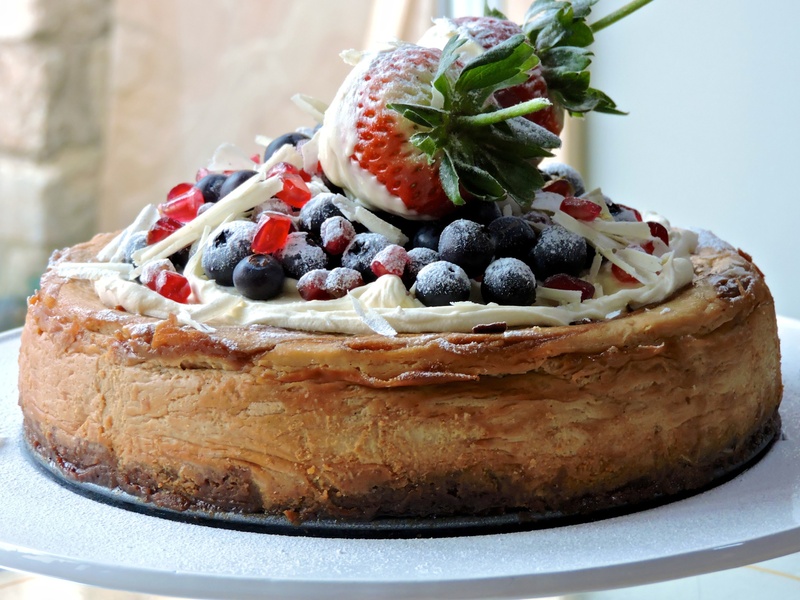 I used Greek yoghurt in the cheesecake to make it a bit lighter and higher in protein but you can use sour cream. I got the caramelised white chocolate idea from a couple of blogs quite a while ago but I was waiting for the perfect time to try it out. Yeah, no hesitation necessary. This stuff is AMAZING. It’s pretty time consuming but you could definitely consider yourself an alchemist after trying it because it’s pretty outside the box. My mind has already gone a bit crazy thinking about all the stuff I could do with it… Cakes, cookies, doughnuts, the possibilities are endless and I actually can’t wait. Ok anyway, back to the cheesecake. 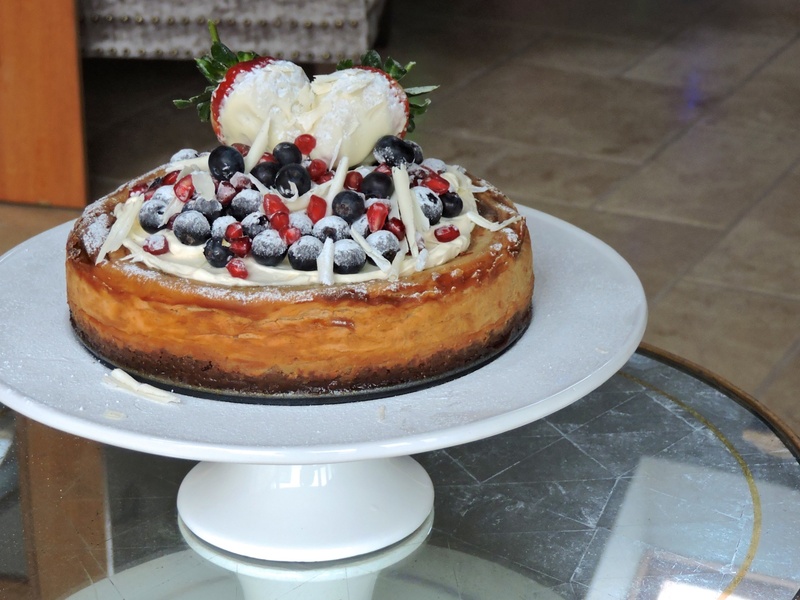 My mum is actually Cheesecake Queen in our family so I sought her advice throughout the process – she is basically Wikipedia. Make the base first. I used whatever biscuits I had in the pantry at the time but if you need some direction then digestives or chocolate biscuits work great. I actually used some of the left over chocolate gingerbread from my Gingerbread House. 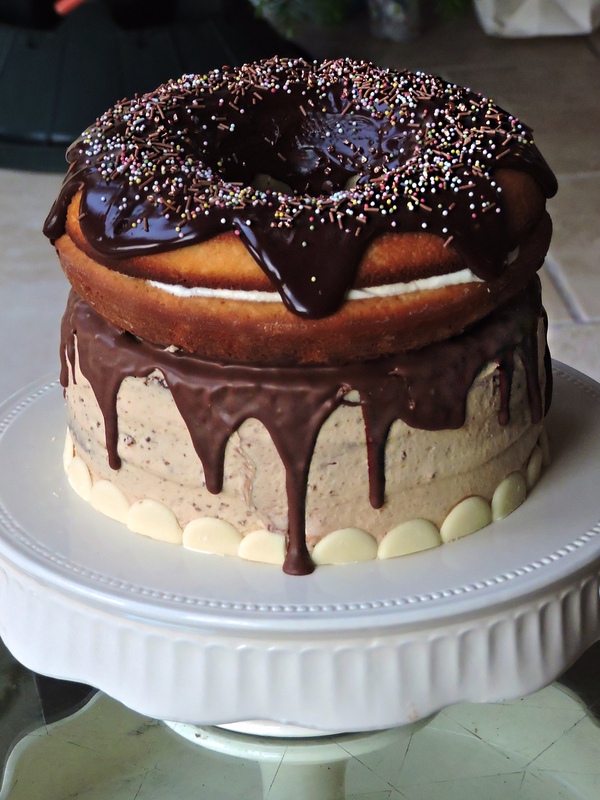 I called this cake a Giant Doughnut Birthday Cake, but it really is so much more. There are four layers of light chocolate coffee cake delicately fragranced with a pinch of cinnamon, sandwiched together and covered with caramelised biscuit spread frosting and topped with a giant doughnut. The doughnut is made from vanilla cake with a white chocolate ganache filling topped with dripping dark chocolate ganache and covered in sprinkles. An adequate cake for my brother’s 24th birthday in my opinion! 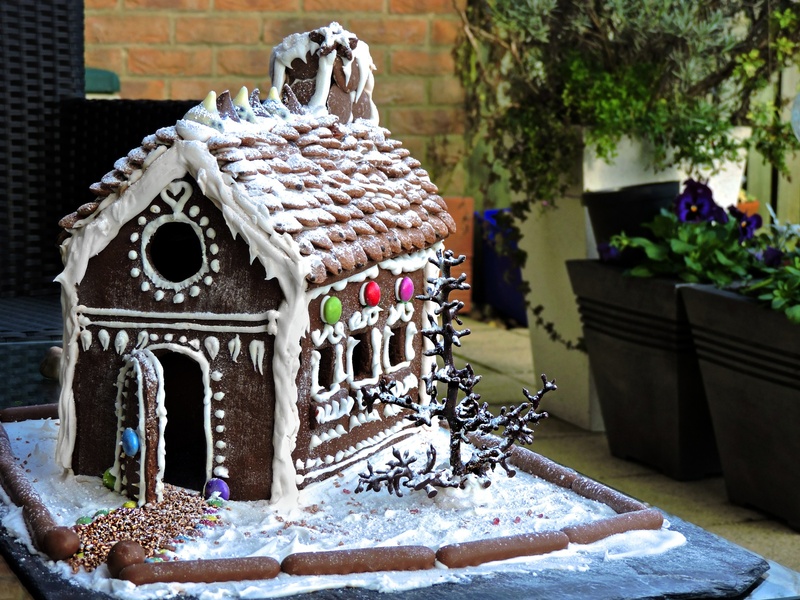 I’ve always wanted to make a gingerbread house… I just never got round to it. This year I was determined to do it. And I mean properly do it so that included measuring out all the templates and relying on simple maths to create a construction that would actually hold itself up. It was actually a very pleasant experience and a really nice and relaxing way to spend a weekend. I was home for the weekend with access to a KitchenAid and I really didn’t want to waste that opportunity so I pottered about on Saturday evening preparing my gingerbread ready for construction and decoration the next day. The whole process sort of humoured my (very talented) parents as they have almost finished a huge redesign and construction project of our family home, except their templates were drawn to scale and designed on CAD software. My 30cm ruler and plain paper wasn’t quite on their level but I felt like they enjoyed watching me do it anyway. The chocolate gingerbread I used to make the house actually tasted so nice, surprising as gingerbread really isn’t my favourite type of biscuit (quick research in uni showed that no one under the age of 50 is really a fan of the stuff). However, this particular recipe was mild and sweet. It didn’t have any of that spice or heat from traditional gingerbread and the chocolate really balanced it out. In fact it was so mild that I’m pretty sure you could convince a small child that they were eating a plain chocolate biscuit. The tablespoon or so of ground ginger gives the smallest hint of warmth and the lack of treacle keeps the biscuit buttery and light. So I’ve seen a few of these floating around pinterest and I thought they looked nice and festive so I gave them a try. 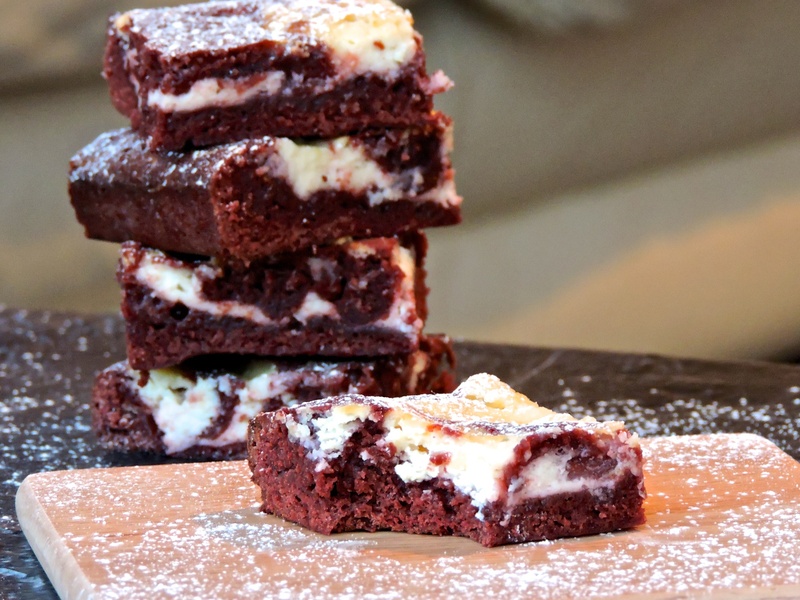 Essentially it’s a (red) chocolate and vanilla flavoured brownie with dollops of cheesecake mixture on top, swirled in to a nice pattern. It’s the perfect balance of sweet and tangy. And it’s good. Really, really good. This week has been a bit of a disaster in terms of baking… My hand mixer broke! I was halfway through making doughnuts on Saturday and it just died on me and the doughnuts became a bit of a lost cause. I also made red velvet cake on Saturday and it just re-ignited my love for all things red velvet. Is it chocolate? Is it vanilla? Who knows… But it’s pretty and red so it’s a winner in my books. 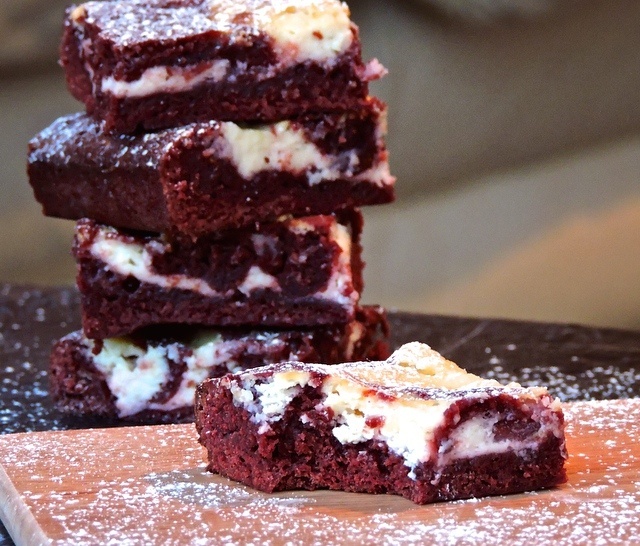 I’ll do proper posts for my classic red velvet cake and baked doughnuts over the next few months. So, I have a new mixer now. It’s pink and has currently taken pride of place in my tiny uni kitchen and everyone must work around it. It’s not just a hand mixer either, it has a stand! Now it’s by no means a Kitchenaid or a Kenwood, but it (just about) does the job and I’m not going to complain! This recipe is super easy and literally takes about 10 minutes to throw together. Perfect if you’re busy with assignments and uni stuff like I am (this is when Christmas is simultaneously the best and worst time of the year).